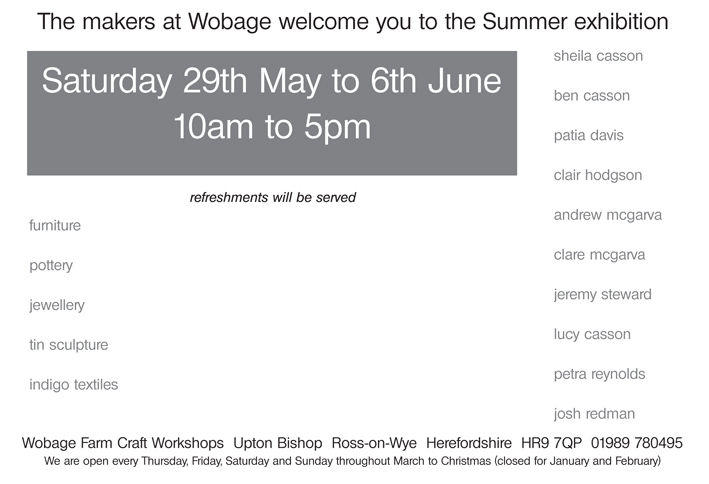 The Wobage makers warmly invite you to join us for our exhibition this weekend. Beginning this Saturday 29th May and continuing every day until Sunday 6th June, 10am-5pm. Enjoy the sunshine, the Wobage lawns and Spring flowers, bring a picnic and relax with a glass of Wobage ‘Early Griffin’ perry and a slice of our delicious home-made cakes. The Wobage makers will be around for most of the week. If you’d like to meet one of us in particular, or talk about any one of the many forthcoming courses this Summer and Autumn, please e-mail or telephone to check we are at Wobage to meet you. 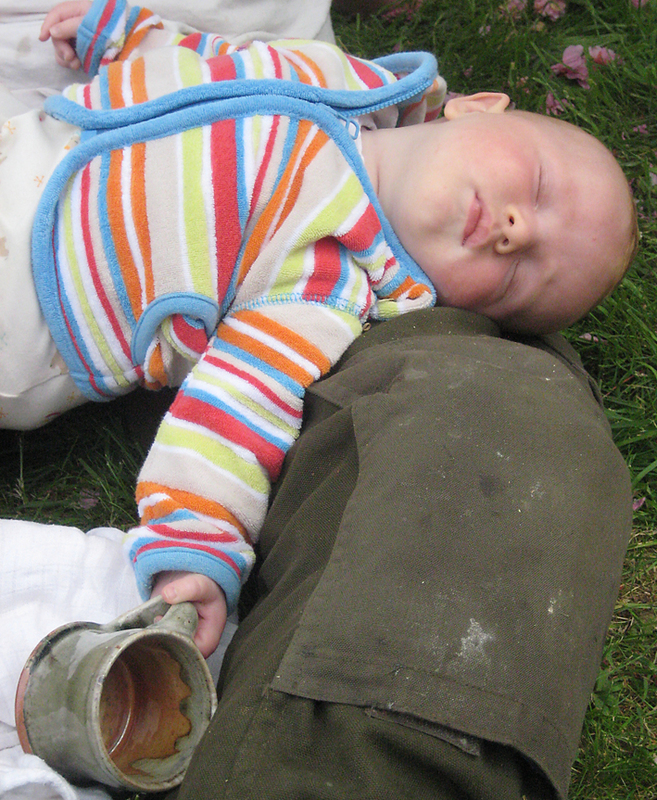 We all really look forward to seeing you over the nine days of exhibition. The Wobage team has been busy this week preparing Sheila’s birthday retrospective of pots, including a ‘for sale’ display of her current salt-fired stoneware and porcelain which has just been unpacked from the gas-salt kiln. Some wonderful mature surfaces, particularly the rich blue-blacks. 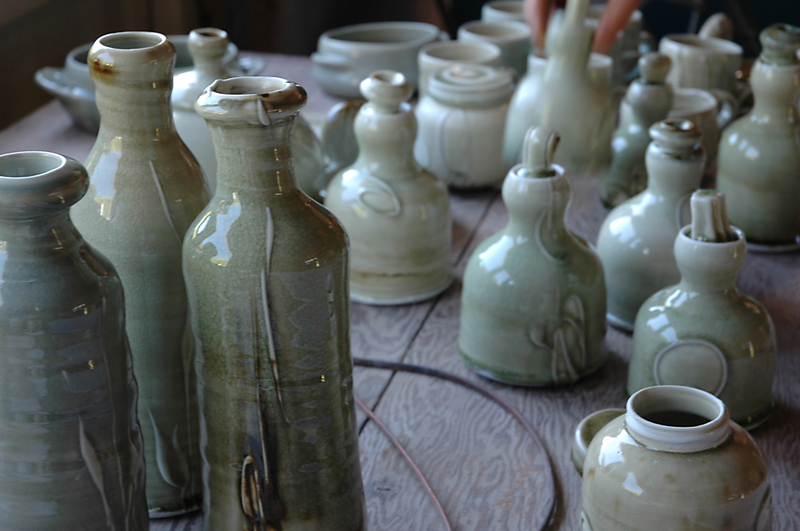 The exhibition is being set up in the entrance of the magnificent threshing barn. The small wood-salt kiln was fired Tuesday 25th and will be unpacked later today, nothing like the smell of a smouldering exhibition plinth! 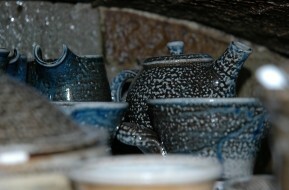 The kiln was crash-cooled and basted just after midnight, and the draw rings looked very promising indeed. Jeremy was assisted over the 20 hour firing by apprentice Sheila Herring, Josh Redman and local potter and cider-maker John Teiser. 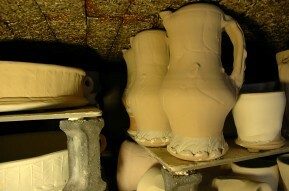 The kiln pack was dominated by Jeremy’s pots, but with mugs of Sheila’s and a shelf-full of Josh’s porcelain. We shall be serving John Teiser’s highly reputed farmhouse perry during the exhibition, made using the rare pear variety, ‘Early Griffin’ collected from the Wobage perry orchard in 2009. 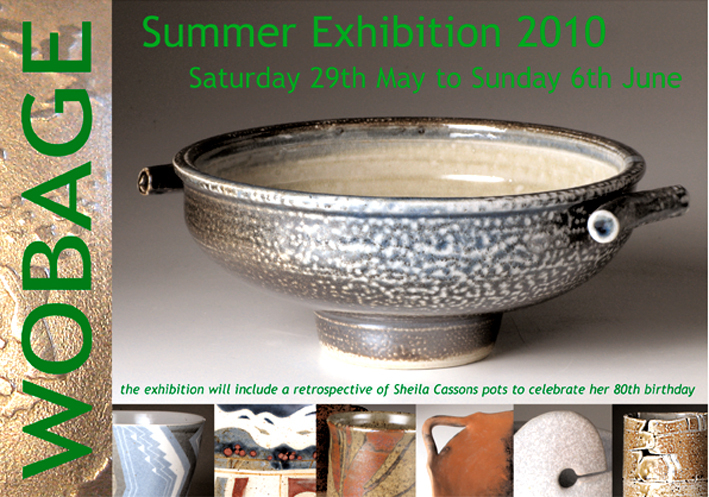 Wobage exhibition, including an 80th Birthday retrospective of Sheila Casson’s work opens Saturday 29th May and continues until Sunday June 6th. Hot from the kiln and ready for our forthcoming exhibition this weekend, Patia is rattling through several firings of both her porcelain and earthenware ranges. Some fantastic new square slip-decorated dishes which have proved very popular indeed, alongside the fresh greens of her yew-ash glazed, reduction-fired porcelain. (see pics) For the first time, she’ll also be exhibiting a new range of screw top jars. 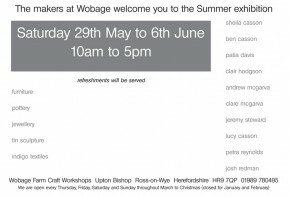 The Wobage makers warmly invite you to join us for our forthcoming exhibition, beginning on the next May Bank Holiday weekend, opening Saturday 29th May 2010, until Sunday 6th June. 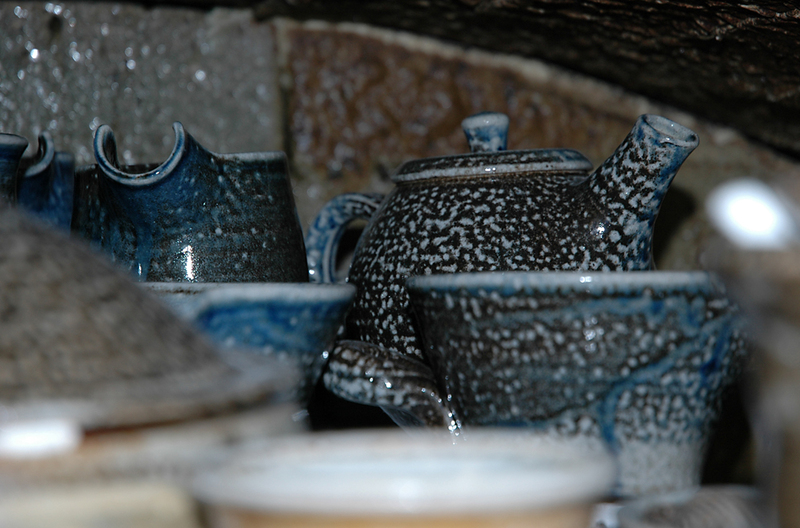 In celebration of Sheila’s 80th birthday this Spring, Wobage Gallery will be displaying a retrospective exhibition of Sheila’s pots. 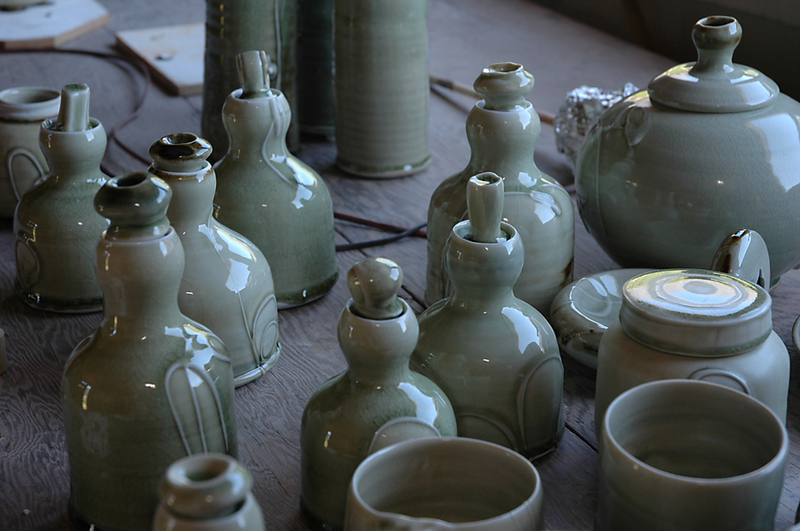 The exhibition will also include new work by Patia Davis, Jeremy Steward, & new Wobage potter Josh Redman. Wood & furniture by Ben Casson, jewellery by Clare Hodgson, tin sculpture by Lucy Casson, pots and tiles by Andrew & Clare McGarva, and indigo textiles by Clare McGarva. 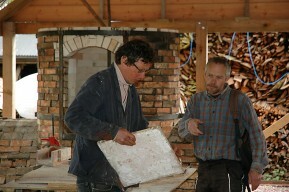 In readiness for the Wobage Summer Exhibition at the end of May, Andrew and Clare McGarva have just delivered fresh pots and tiles from their workshops in Burgundy, France. For a closer look at their recent production have a browse through their website. 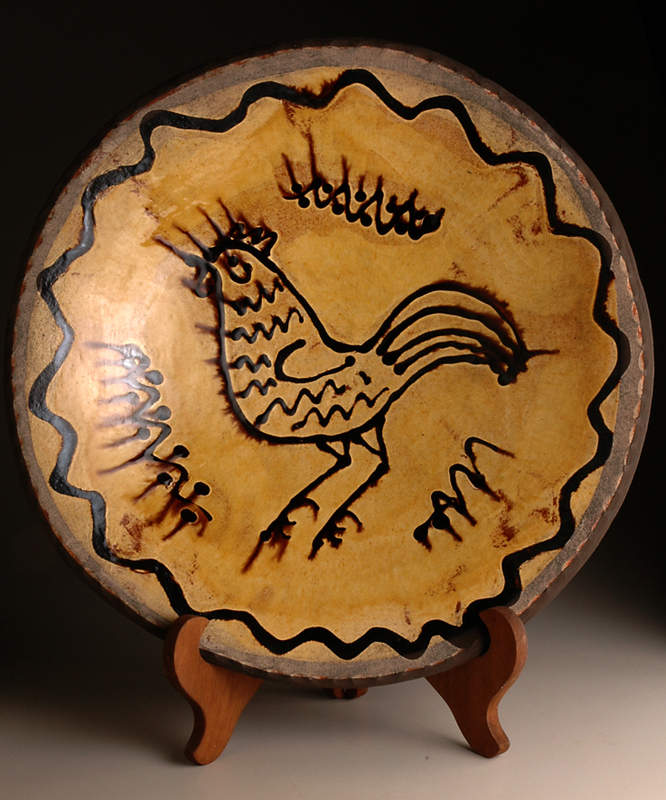 You’ll find images featuring Andrew’s large slipware dishes, the McGarva’s widely recognized blue and white domestic pots and Andrew’s range of medieval style floor tiles.